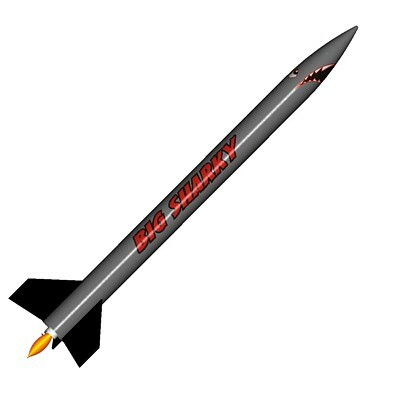 ModelRockets.us Big Sharky Model Rocket Kit - The Big brother to the Lil Sharky. Easy to build larger diameter and longer kit with slower majestic lift-offs. It really takes a bite out of the sky! The body tube is laser pre-cut for the fins and the motor mount is pre-marked by laser as well. You do not need a ruler or a knife to assemble the Big Sharky. The kit is designed for durability with a thicker .025in body tube, 1/8in balsa fins, thru the wall fin mounting and 2mil thick parachute. The Big Sharky is an easy to build level 1 kit ideally suited for educational and group projects.